This pack includes six paper designs for scrapbooking, art journaling, digital artistry, hybrid crafting and more. These bespoke papers are hand painted with abstract art. Papers are saved in US Letter, International A4 and 12" Square and were created and saved at 300 DPI for optimum print results and saved in JPG format. This element pack includes six hand crafted pieces of textured gesso/white paste stamps ideal for digital and hybrid scrapbooking, digital artistry, art journaling, paper crafts and more. Note that they are semi transparent in places and are designed to be dragged on top of your background like paint. Created at 300 DPI for optimum print results. Elements saved in PNG format. "Blessed are the curious for they shall go on adventures!" Put your imagination in the upright position joymakers- because your stories are about to take off with this value priced mega collection! It includes the page kit with JUST PLANE FUN papers (30 patterns and 10 solids!) an alpha set (A-Z and numbers 0-9) and is overpacked with over 100 pretties and Word Art that are guaranteed to prompt layouts that are just plane fun! What's inside the kit? a collection of happy travelers, a flight attendant, 2 airplanes, piles of luggage, a boarding pass, luggage tags, a passport, a camera, puffy clouds, a credit card, a travel journal, a cell phone, 3 little flowers 2 brads, 4 buttons, ataxi, various stamps and frames, pilot wings, 3 push pins, bits of ribbon and string, Travel signs, 11 rubber word snips, a globe, a variety of journal tags, and a various themed word art! Over 100 pieces in all! Next, you'll unpack the pack of 14 Journal Cards in individual PNG, JPG and grouped PDF format so that they will play well with your digital, hybrid and pocket scrapping projects! The PDF format is in 8.5 x11 so they are Print Ready for your home printer! The cards on the PDF sheets have a light border to make for much easier cutting- included are the 14 cards shown (4) 4x6 and (10) *3x4 cards in png format as well as (3) PDF Sheets. Next, you'll enjoy a collection of 25 .png stamps and coordinating .abr brush pack ready to add bonus miles to your travel layouts! Finally, your flight will also include 12 .png travel themed veneer styled pennats with a retro flair that will upgrade your layouts toFirst Class! The sky is the limit for all the stories you can tell with this collection! 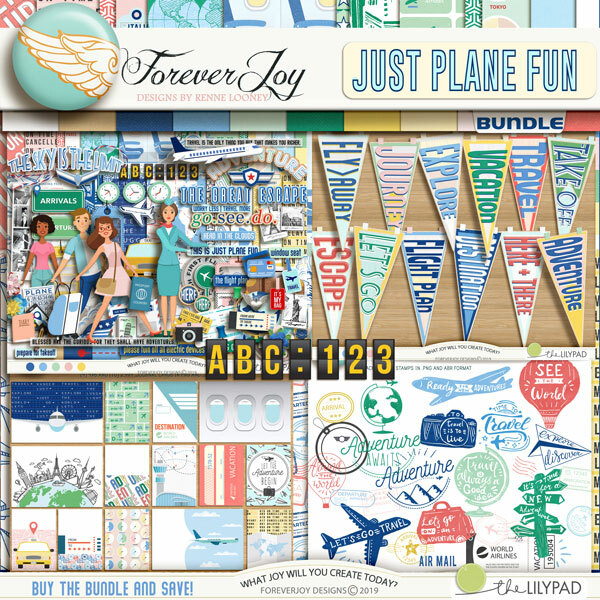 The page kit includes the JUST PLANE FUN papers (30 patterns and 10 solids!) an alpha set (A-Z and numbers 0-9) and is overpacked with pretties and Word Art that are guaranteed to prompt layouts that are just plane fun! Here's what you'll unpack: a collection of happy travelers, a flight attendant, 2 airplanes, piles of luggage, a boarding pass, luggage tags, a passport, a camera, puffy clouds, a credit card, a travel journal, a cell phone, 3 little flowers 2 brads, 4 buttons, ataxi, various stamps and frames, pilot wings, 3 push pins, bits of ribbon and string, Travel signs, 11 rubber word snips, a globe, a variety of journal tags, and a various themed word art! Over 100 pieces in all! Drop shadows for illustration only. *Previews may show pieces of this element pack combined with the coordinating add ons that can be found in the value priced Bundle. This set includes PNG and SVG files created at 300 dpi. This pack includes 61 unique elements (85 including variants). Size: 3600x3600px (12x12"). 300dpi saved as JPG files. * (4) 3"x4" Cards in multiple formats: PNG (for home printing), JPEG with bleed (for professional printing) and PDF print sheets.